June 21st is dedicated to celebrating all of our amazing Dads! With Father’s Day just around the corner, there are certainly ways to show your Dad how much he means to you. Of course, quality time with Dad is a great way to spend this special day, but don’t forget to pick your Dad up that perfect gift to really show how much he’s appreciated! This year for Father’s Day it might be a good idea to pick something more inspiring than the typical gift or card. Sure, there is the classic tie, new tech gadget, or some sort of sporting good, but let’s face it, these gifts are boring. We can help you make his Father’s Day extra happy this year. Here at How to Make Apple Pie Moonshine, we think the best gifts come in the form of moonshine! Our Spice Kit and packs make a perfect gift for your Dad because, let’s face it, he is probably never going to really use the bug-zapper or those roller blades you had in mind. Trust me. Giving him the ability to make delicious moonshine will inspire a new hobby that he can enjoy time and time again. Our Spice Kit recipes are hand packed for perfection. We have tried many different recipes to ensure that the best all-natural ingredients were included in each kit. We are sure that our refined recipes will please his palate. With one kit you can flavor up to three quarts of your favorite liquor, moonshine, whiskey, or even vodka. Although making moonshine sounds like a difficult task, it is easy to master. With a few simple steps, your dad will be enjoying his own moonshine. How to Make Apple Pie Moonshine here. Our classic Apple Pie Spice Kits are a combination of just the right amounts of sweet and spicy to mimic that authentic sweet and crisp taste of America’s favorite dessert. Our Dads have many great qualities. It’s not only their love for us or how they support us in every crazy turn our lives take but also that no matter how doggone hard we make their lives, they are more than happy to accept delicious gifts for putting up with it all. There is not much in the world that I love more than cocktail hour out on the lake with my Dad, catching up and enjoying each other’s company every Father’s Day. 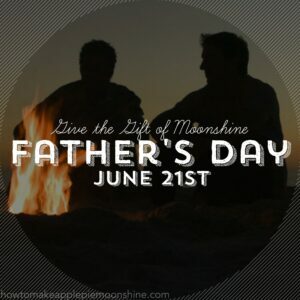 But no matter how you celebrate your own awesome Dad, whether it’s a BBQ in the back yard, a day full of fishing, or a hiking adventure, he will certainly be glad you picked that perfectly flavored moonshine. So this year show Dad how much you really care and do Fathers Day the Moonshine way. Buy him a gift that is certain to make him “shine” on his special day—the gift of perfectly flavored moonshine with our Apple Pie Moonshine Spice Kits! Student at Colorado State University studying Communication Studies and Interior Design.